My day job is M-F, 8-5. I’m thankful that I have such a job. I’m home every evening and off every weekend. However, it does make having access to certain things a little difficult. Dr.’s appointments for instance require planning and scheduling of vacation time. Blah, blah, blah. I have also lamented on many occasions that I have had difficulty finding a lumber yard. Most are an hour away and are on the same work schedule as I am. So I have made an effort to design and build projects with material that can be had at the local Home Center. The few material exceptions that cant be sourced at the Home Center, I generally mail order. I rarely take vacation. That means at the end of the year I always have several days of unused vacation. These days do not carry over and I generally just cash them in for the pay. This year though, I only cashed in part of the time and managed to take three full days off from work. So I decided to take another try at finding a proper lumber yard. After several failed attempts, I hit pay dirt. I found a lumber yard just over an hour away from my house that was willing to sell a minimum of 100bdft. 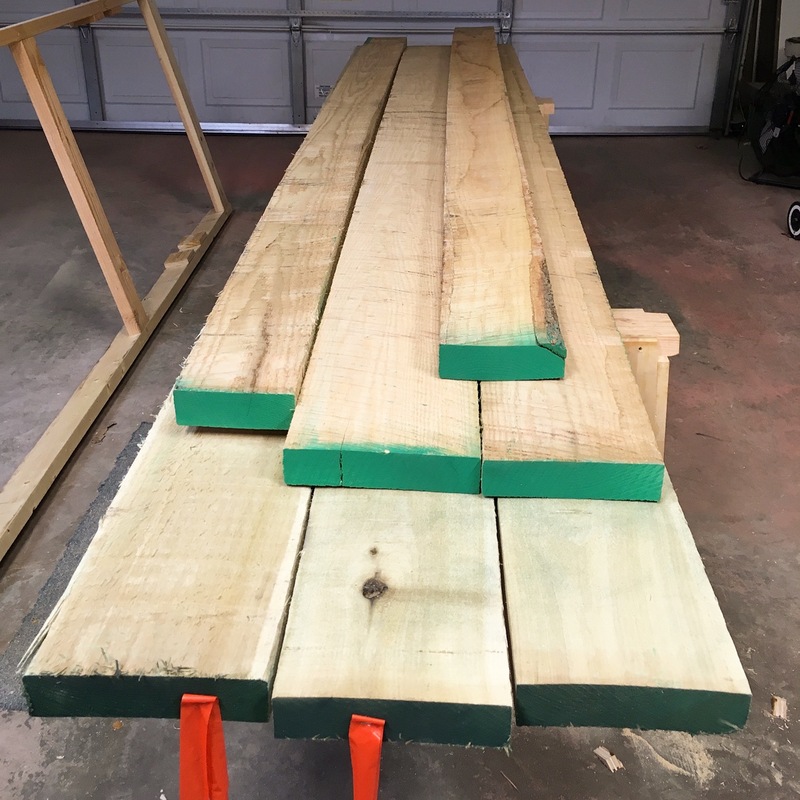 Several emails were exchanged and I placed an order for 50bdft of 8/4 red oak and 50bdft of 8/4 poplar. (I have several staked projects on the list). So this morning, my nephew and I made the hour drive and picked up my early Christmas present. So if you are in the northeastern Ohio area and need lumber, you should give Ohio Hardwood and Plywood a call. Mike and staff are very helpful and a pleasure to do business with. This entry was posted in 8-Miscellaneous. Bookmark the permalink. Didn’t happen to hear something about shipping, did you? I’m just one state away (Philadelphia), and a lot of quality yards ship as long as it’s the right size. Meantime, marry the daughter or something so you can get picking rights. Have a healthy New Year Greg, and do not quit the day job. Sorry Jeff, I didn’t ask about shipping. They are very responsive to email though. Just send them a note after Christmas. Yep, I’ll be keeping the day job. It’s not too bad. Ach, du lieber! I forgot to tell you. Wood by the board foot is measured by length x width x height. That’s three dimensional, or as we like to say, cubic. You can’t use just both hands (ten fingers) to calculate the cost: you’ll need someone else to lend you a hand, so you’ll have three to work with. Um, the picture on the side: who is hiding the glue brush from whom? Ha…I’m working on a method of making a glue brush from a cheap natural bristle paint brush. Looks like I can get 3 or 4 glue brushes from a $2 paint brush and a few scraps of wood. That came as a surprise to me, because by reading blogs like yours I had the misconception that in the US you had places to buy wood in “almost any corner”. Just in the other week I talked to an local old timer (+70) about wood and blogs and the guy say literally “USA an Canada are the woodworkers heaven, there’s no way we can ever relate to them”. So nice findings! You’re starting 2017 woodworking in a great way! LOL…I think that there are many misconceptions about life in the USA. It would be like me visiting Paris, France and thinking all of Europe was exactly like that. I bet your and my day-to-day lives are very similar. Yes, but it kind is my fault, by now I should realize that USA, Canada, Australia etc, are not just big countries. You live in a nation formed by several different states. Your example was spot on! But, Paris really is like that: great hooch and the ladies have great gams. I’m kind of lucky. There are quite a few sideline sawyers around where I live. The trouble is having the logs. There are actuall several sawmill and kiln operations close by. The problem is that they are not set up for retail. Especially small volume. They typically sell thousands of board feet at a time. Your welcome. Glad you are finding it useful.